American Airlines announced that beginning Sept. 5, Basic Economy fares will include both a personal item and a carry-on bag like other Main Cabin fares. Dublin, Ireland | May 11, 2018–The “Global Airport Baggage Handling Systems Market – Segmented By Airport Capacity And Geography – Growth, Trends, And Forecast (2018 – 2023)” report has been added to ResearchAndMarkets.com’s offering. Airport terminal extensions and new terminal development ventures globally, owing to increased air passenger traffic are driving the airport baggage handling systems market. Recently developed and modernized air terminals have to be supplied with the interlinked baggage conveyor system, which is expected to drive the baggage handling systems market. With terrorist threats around the globe, airplane terminals have stepped up their luggage security. The security procedure is highly time-intensive and influences the general proficiency of baggage handling operations. The increasing number of air passengers coupled with existential security threats is expected to increase the demand for these systems. The growth in middle-class population in the developing countries, such as China and India has increased the air passenger traffic, and this trend is expected to continue. To handle the growth in the air traffic, many airports in different parts of the world have been undergoing expansions creating demand for airport baggage handling systems. Airport expansion projects are underway across the world. All the countries that are part of Gulf Cooperation Council are in the midst of expanding their airports, as the region has few of the world’s busiest airports the growth in the air traffic will necessitate expansion of capacity to provide seamless travel experience. India under its regional connectivity scheme has envisaged developing the underserved and unserved airports to boost domestic air travel. The Heathrow airport in London, the busiest in the European continent is undergoing expansion. The construction of both Greenfield and Brownfield airports is expected to drive the demand for such systems. Air Transport IT Summit, Jaipur, India | March 22, 2018– The Airports Authority of India (AAI), which manages 126 airports across India, has expanded SITA’s baggage management solution to 15 airports. SITA’s BagManager will provide the airports with real-time information on the status of passengers’ baggage, significantly reducing the chances of baggage mishandling. Johannesburg, South Africa | July 26, 2017– Lanseria International Airport is investing in SITA’s self-service technology that will add new convenience for passengers while providing improved common-use functionality for airlines. Using SITA’s self-service systems, passengers will now be able to quickly check-in and drop their bags before proceeding directly to the gate without having to visit a traditional check-in counter. 2017 Air Transport IT Summit – Barcelona, Spain | May 24, 2017– SITA, the IT specialist that is transforming air travel through technology, today rolled out several community innovation demos with an eye toward the future at this year’s Air Transport IT Summit. These forward-looking innovations are part of SITA’s 2016 multi-million investment across five main focus areas to explore new solutions to some of the air transport industry’s most pressing challenges. Demos shocased included the innovative WorldTracer Ground Delivery Baggage Tracking App which allows airlines to track delayed bags until they reach their final destination and Travel Identity of the Future, a new approach to identity management to enable secure and rapid passenger flow through airports. The multi-million dollar community innovation investment is over and above SITA’s continued investment in new products. It is aimed at looking further into the future of promising technologies or new ways of doing things that could have a big impact and significant benefit to the air transport community. In addition, SITA announced seven new member benefits to enhance nine offers made available in 2015. The offers, exclusive to SITA’s 400 plus members, consist of free trials and preferential contract terms for services. These include SITA’s Mobile Boarding Pass API, which gives airlines flexibility to easily create and distribute mobile boarding passes and SITA’s sophisticated baggage services BagConnect and WorldTracer Tablet. Members can also benefit from free consultancy services for SITA’s cloud services and Horizon solutions along with preferential terms for messaging services SITATEXT Online and the new MessageIntelligence Archive. Singapore | October 20, 2016– Leo, the innovative baggage robot, is touring Asia, with visits to Singapore and Hong Kong. Leo is a fully autonomous, self-propelling baggage robot which provides a glimpse into the future of baggage handling that is being explored by SITA Lab the technology research team at global IT provider SITA. After spending time at some of SITA’s key customer locations, Leo can be caught in action at the Future Travel Experience Asia EXPO 2016 taking place 25 – 26 October in Singapore. This is Asia’s biggest free-to-attend passenger experience expo and this year the expected combined attendance of 3,000+ will have the chance to see Leo up close. Next stop for Leo is Hong Kong International Airport (HKIA) where it will be on show for the participants of HKIA’s second Technovation Conference and Exhibition which will be focusing on smart airports. Dubai | October 19,2016– The global deployment of Radio Frequency Identification (RFID) technology, which can accurately track passengers’ baggage in real time across key points in the journey, can enable the air transport industry to save more than US$3 billion over the next seven years. SITA’s and IATA’s assumptions are based on RFID being deployed in 722 airports (representing 95% of passenger numbers globally) over a six-year period between 2016 and 2021 while the savings are calculated over seven years to 2022. The figures for 2016 take into account the RFID infrastructure already deployed or about to be deployed at multiple induction points on the baggage journey. SITA’s research into RFID and baggage tracking is part of its ongoing investment in research for the benefit of the entire air transport community. Baggage tracking is one of the five community research programs that SITA has launched to address some of the industry’s most pressing challenges. The others are identity management; the facilitation of IATA’s New Distribution Capability (NDC); an industry-wide disruption warning system; and enhancing cybersecurity across the industry. Annapolis, MD | July 20, 2016– Rockwell Collins, working in conjunction with Pulse.aero, has recently deployed two major self-service bag drop zones in Terminals One and Two at Dublin Airport through an agreement with daa. The multimillion dollar project streamlines and simplifies the baggage check-in process. The new systems are already having a significant impact including increased check-in capacity and shorter lines. Comparing statistics from this year’s June bank holiday weekend to 2015, the use of the kiosks has reduced check-in times considerably. Terminal One, home to Ryanair, now has 15 self-service bag drop units. The units use a one-step approach, allowing passengers who have checked in online to take their bags directly to a bag drop unit where they can print and tag their luggage. The bag is then dispatched straight into the baggage system. In Terminal Two, the airport now has 32 self-service kiosks and 12 bag drop units in the Aer Lingus check-in area. The bag drop units in Terminal Two are the world’s first touchless bag drops, employing a two-step approach. Passengers first use their reference number to print a boarding card and/or weigh their bag and print a tag. Once tagged, the luggage is taken to the self-service kiosk and the bag is automatically dispatched. The self-service solutions will be expanded to additional airlines in the near future and more features, such as baggage payment, will be added over the summer. 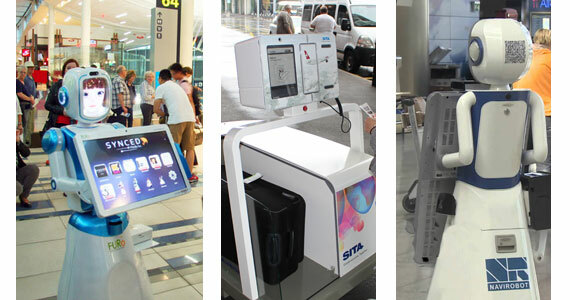 SITA Wants Robots To Make Your Airport Visit Easier… and More Stuff! 1. IFExpress: Let’s get started with robot power, we assume it is charged via wall power during the night and via alkaline or lead batteries while in use? 2. IFExpress: Please describe the way a human interacts with the robot? “Leo then takes the bags directly to the baggage handling area where they are sorted and connected to the correct flight while the passenger heads straight to the gate, bypassing the check-in hall. Being a fully autonomous, self-propelling baggage robot, Leo is able to transport bags from the point of bag drop to where they are handed over to be injected into the baggage handling system. 3. IFExpress: Please describe how it finds its way to the required destination? I presume robot speed is fixed? 4. IFExpress: Will airport inside destinations required any new facility construction? 5. IFExpress: Has an approximate cost/price been determined of the robot? 6. IFExpress: Please describe and detail the human/movement sensors and protections? “The robot has two laser-based sensors: one in front and one at the back of Leo. The robot is programmed to stop when the sensors detect an object either in front or behind. Sometimes if an object is close but still a safe distance away, the robot will decelerate until it is free of the object and then re-accelerate. 7. IFExpress: If I were an airline or airport, why would I want this device/system in my airport? “During the trial at Geneva Airport, Leo demonstrated how, by taking the bag drop process out of the terminal building, the number of trolleys and bags in the terminal could be significantly reduced. 8. IFExpress: Are there any rough technical specs available? 9. IFExpress: How would an airline or airport contact SITA/manufacturer of the robots if they wanted to test out a system? 1: Here is a news release from Gogo about their new relationship with Aeromexico: Today, Gogo partner Aeromexico announced the launch of a pilot program to provide complimentary in-flight access to Netflix. Netflix members onboard select Aeromexico flights within Mexico, Central & South America will be able to stream the best programming available in the skies, including hit series Orange Is The New Black, Club de Cuervos and Chef’s Table, on their phones, tablets, and laptops at no cost starting on June 17th and through October 17th 2016. 4: Here is a new IFE & Connectivity Show in the US – IFE and Connectivity USA. And, it is co-located with Innovative Aircraft Seating – USA, June 27 – 28 in Seattle, WA! 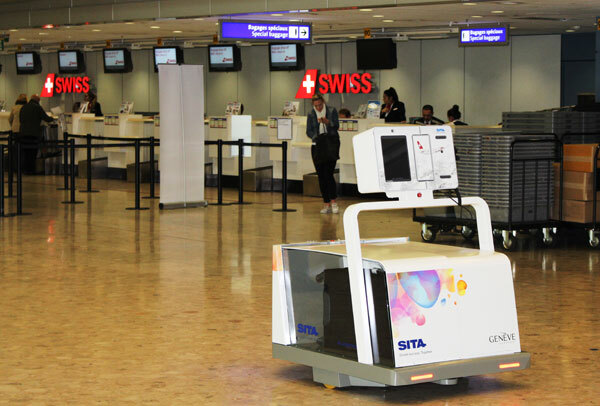 Geneva | May 17, 2016– Passengers arriving at Geneva Airport in the past few days have received help with their bag drop from Leo, an innovative baggage robot developed by air transport IT provider SITA, which is being trialed outside the airport’s Terminal 1. Geneva, Switzerland | December 2, 2015– SITA, the world’s leading specialist in air transport communications and IT solutions, today announced the acquisition of private company Type22, a market innovator that is driving the development of self-service bag drop solutions. The company founded in 2006, is based in Delft, The Netherlands. The acquisition will strengthen SITA’s position as market leader of end-to-end technology solutions that enhance the passenger experience. The Type22 self bag drop portfolio, including Scan&Fly and Drop&Fly, will complement SITA’s suite of intelligent airport IT solutions designed to improve the entire passenger process from curb to arrival hall, resulting in reduced costs and improved customer service. SITA will continue to develop Type22’s products and will provide support for all Type22’s existing customers. Members of Type22’s staff will remain located in Delft, The Netherlands. Innovation in self-service technologies such as self-service bag drop, self-service bag tag printing and bag tracking has led to significant cost savings for the air transport industry (ATI) since 2007. 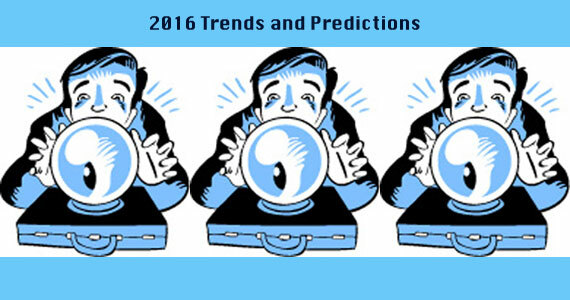 More information on these trends can be found in SITA’s 2015 Airport IT Trends Survey.